We are very pleased to announce that Finisar Australia was awarded the 2016 Control Systems, Networks, Information Processing and Telecommunications Excellence Award by the Institute of Engineers Australia NSW Branch. 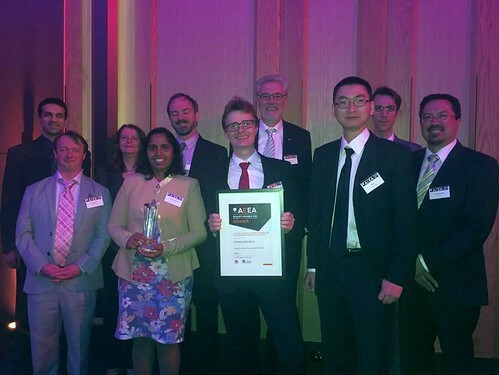 The award, which forms part of the Australian Engineering Excellence Awards was given for the development and commercialisation of the Coherent Optical Measurement System (COMS), which forms the core of our WaveAnalyzer and HR-OCM products. The award was presented at a gala dinner, attended by over 500 people, at the Sheraton Darling Harbour in October. The photo below shows some the successful engineering team that developed the core technology, along with the trophy and certificate received. As a winner of the NSW State award, the COMS technology is now in the running for a National award, the results of which will be announced at the Engineers Australia Annual Dinner in Brisbane at the end of November. Congratulations to everyone involved in the COMS development on winning this award.